Sergeant James Carl Rodarte was born October 11, 1948. He served with distinction as a Ranger Team Leader with L Co Rangers, 75th Infantry 101st Airborne Division (Airmobile) in Vietnam and was wounded three times in combat. He was a member of L Co Rangers during the period 1969-1970. Prior to being assigned to the 101st Airborne Division, Jim had a previous tour with the 173rd Airborne Brigade. He graduated from Jump School at Fort Benning, Georgia and MAC-V RECONDO School at Nha Trang, South Vietnam. 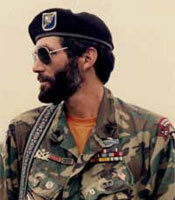 In addition to the parachutist badge and MAC-V RECONDO Brand, He was also awarded the Combat Infantryman Badge, Bronze Star, Purple Heart W/2 Oak Leaf Clusters, The Army Commendation Medal, National Defense Service Medal, Good Conduct Medal, Vietnam Service Medal and Vietnam Campaign Medal. Sgt Rodarte was fondly known as 'Jungle Jim' for his expertise and skill at jungle operations. He was an outstanding Ranger Team Leader and was highly regarded by everyone in the unit. Ranger Jim Rodarte died on 22 February 2018 in Greensboro, North Carolina and was buried with full military honors. It is altogether fitting that we honor him here today at the Fallen Ranger Memorial.